A flick-screen platform action game originally for the Commodore 64, later ported to several other platforms, Impossible Mission was a game about running from room to room, jumping over and avoiding deadly robots, while searching the stationary objects in each room for puzzle pieces, which are randomly distributed throughout the game each time the game is started and, if flipped correctly, can be pieced together. With the completed puzzle, the player can win the game. The game had to be completed in 6 hours and each time the player died, 10 minutes were deducted from the playing time. 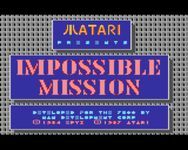 It was sequelled by Impossible Mission II (multiple) and Impossible Mission 2025 (Amiga). The Commodore 64 version is notable for its early use of digitized speech. The digitized speech was provided by the company Electronic Speech Systems, who drastically raised their prices after Impossible Mission became a successful test case. Epyx did not deal with ESS again as a result. Most famous among those sound effect were the welcome sound: "Ah, another visitor. Stay a while… staaaaay FOREVER! ", which became much more famous in C64 environments than the game itself. The NTSC Atari 7800 version has a confirmed bug that makes the game impossible to win; it places some of the code pieces underneath computer terminals, which the player cannot search (since attempting to do so will access the terminal). The bug was fixed in the PAL version. Rumors of a bug fix for the NTSC version were put to rest when Atari formally announced the retirement of the Atari 7800 on January 1, 1992." Source: Wikipedia, "Impossible_Mission," available under the CC-BY-SA License. The release information is from English Wikipedia, with the exact release date for the C64 release from Italian Wikipedia. The release for the Master System is said to be 1988 on the IM entry and on Gamespot, but 1990 on others. The IM entry claims 1987 for the 7800 release, Gamespot claims 1986. Then again, Gamespot claims 1985 for the original release, which goes against most other information. The IM wiki entry claims a NES release, but it's not listed in the Wiki page for NES games. The IM wiki entry claims a DS release, not found elsewhere.